I took this photograph in '09 while visiting Barcelona, Spain at Antoni Gaudí's, Temple Expiatori de la Sagrada Familia. Columns on each side of the central portal are topped with palm fronds. 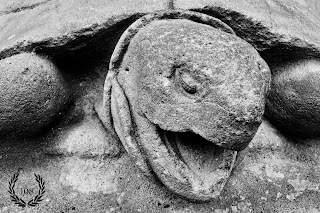 The bases are a tortoise and a turtle, symbols of the stability of the cosmos.